I actually planned to make a log cake but due to time constraint, I decided to make this cake for our Christmas Celebration on 25 Dec 16. 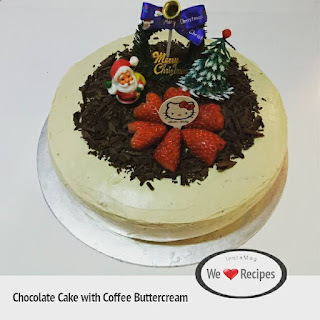 This is the first attempt making this buttercream by Lucinda and I am glad that it turned out well with only 3 ingredients and easy steps. Will definitely use this buttercream for all my cakes. 1. Preheat oven at 170 deg C.
2. Whisk eggs and egg yolk, sugar and salt till pale and ribbon stage. 3. Add milk, follow by flour and cocoa powder until just combined. Do not over beat. 4. Pour into baking tin and bake for 30mins or until skewer comes out clean. 1. Cook egg whites and sugar over double boil. 2. Stir with a whisk until sugar dissolves. 3. Take away from heat and beat with electric whisk till stiff peak. 4. Add butter, coffee emulco and beat till creamy. 5. Spread buttercream on cake and decorate as required.